A coronary stent is an artificial support device placed in the coronary artery to keep the vessel open after treatment for coronary artery disease. Also called atherosclerosis, coronary artery disease is a build-up of fatty matter and debris on the walls of the arteries. Over time, this buildup narrows the arteries and reduces blood supply to the heart. The stent is usually a stainless steel mesh tube that is available in various sizes to match the size of the artery and hold it open after the blockage in the artery has been treated. The coronary stent is used to keep coronary arteries expanded, usually following a balloon angioplasty or other interventional procedure. Balloon angioplasty (also called percutaneous transluminal coronary angioplasty, or PTCA) and other interventional procedures are performed to open narrowed coronary arteries and improve blood flow to the heart. By forming a rigid support, the stent can prevent the vessel from reclosing (a process called restenosis) and reduce the need for coronary bypass surgery. According to the American Heart Association, 1,025,000 angioplasties were performed in the United States in 2000; of these, 561,000 were balloon angioplasties. There were 655,000 men and 370,000 women who had angioplasties in 2000. Stent placement is part of more than 70% of interventional procedures. Coronary stenting usually follows balloon angioplasty. After the patient receives a local anesthetic to numb the area, a cardiac catheterization procedure is performed in which a long, narrow tube (catheter) is passed through a sheath placed within a small incision in the femoral artery in the upper thigh. Sometimes, the catheter is placed in an artery in the arm. A catheter with a small balloon at the tip is guided to the point of narrowing in the coronary artery. Contrast material is injected through the catheter so the physician can view the site where the artery is narrowed on a special monitor. When the balloon catheter is positioned at the location of the blockage in the coronary artery, it is slowly inflated to widen that artery and compress the blockage or fatty area into the artery wall and stretch the artery open. The stent is inserted into the artery with the balloon-tip catheter. When the stent is correctly positioned in the coronary artery, the balloon is inflated, expanding the stent against the walls of the coronary artery. The balloon catheter is deflated and removed, leaving the stent permanently in place to hold the coronary artery open. Stents coated with drugs to decrease clotting or narrowing at the site are currently under investigation. These coated stents have significantly reduced restenosis rates—down to 3%—in some clinical studies. One coated stent brand, the Cordis CYPHER, became the first coated stent approved by the FDA in April 2003. A cardiac angiography will follow to ensure that the stent is keeping the artery open. The patient should quit smoking or using tobacco products before the procedure, and needs to make the commitment to be a nonsmoker after the surgery. There are several smoking cessation programs available in the community. The patient can ask a health care provider for more information about quitting smoking. The patient is usually instructed to take aspirin or another blood-thinning medication for several days before the procedure. Aspirin can help decrease the possibility of blood clots forming at the stent. It is advisable for the patient to arrange for transportation home, because drowsiness may last several hours and driving is not permitted after the procedure. After midnight the night before the procedure, the patient should not eat or drink anything. The patient usually goes to the hospital the same day the procedure is scheduled, and should bring a list of current medications, allergies, and appropriate medical records upon admission to the hospital . An intravenous needle will be inserted into a vein in the arm to deliver medications and fluids during the procedure. The catheter insertion site may be shaved. A sedative is given to make the patient drowsy and relaxed, but the patient will not be completely asleep during the procedure. The procedure generally takes from 90 minutes to two hours to perform, but the preparation and recovery time add several hours to the overall procedure time. Although patients often go home the same day or the evening of the procedure, they should plan to stay at the hospital most of the day. The patient is instructed to stay flat in bed without bending the legs so that the artery can heal from the insertion of the catheter. A stitch or collagen plug may be placed at the site of the catheter insertion to seal the wound and firm pressure may be applied to the area. A flat position is required for two to six hours after the procedure. A health care provider will help the patient get out of bed for the first time when the doctor approves it. The patient will be allowed to eat after he or she is able to get out of bed. The patient is closely monitored during the recovery period. Vital signs and other parameters such as the heart's rhythm and electrical activity as well as oxygen and carbon dioxide levels in arterial blood are checked frequently. A catheter may be placed to drain urine during the recovery period. A blood thinner may be given to the patient intravenously for the first few hours after the procedure to prevent clotting. Medications are prescribed to control pain. Minor chest discomfort is common after the procedure. However, the patient should notify the health care provider if severe chest, arm, or back discomfort is experienced. Some bleeding and bruising near the catheter insertion site are also common after the procedure. However, severe bleeding should be reported to a health care provider immediately. If bleeding occurs, the patient should contact 9-1-1 and lay down immediately. The dressing covering the area should be removed and firm pressure should be applied to the area until help arrives. Ointments, lotions, and dressings should not be applied to the catheter insertion site unless specific instructions have been given. Medications are prescribed to prevent unwanted blood clotting. Daily doses of aspirin or other anticoagulant medications are started after the procedure and are continued after the patient goes home. The patient should not have any magnetic resonance imaging (MRI) tests for six months after the procedure, because the magnetic field may move the stent. Quitting smoking. Smoking causes damage to blood vessels, increases the patient's blood pressure and heart rate, and decreases the amount of oxygen available in the blood. Managing weight. Maintaining a healthy weight by watching portion sizes and exercising is important. Being overweight increases the work of the heart. Participating in an exercise program. The exercise program is usually tailored for the patient, who will be encouraged to participate in a cardiac rehabilitation program supervised by exercise professionals. Making dietary changes. Patients should eat a lot of fruits, vegetables, grains, and non-fat or low-fat dairy products, and reduce fats to less than 30% of all calories. A diet low in cholesterol and vitamin K (to prevent interference with the anticoagulant medication) may be recommended. Taking medications as prescribed. Aspirin and other heart medications may be prescribed, and the patient may need to take these medications for life. Managing other health conditions such as diabetes or high blood pressure. Taking medications as prescribed and following the doctor's guidelines are very important ways for the patient to manage his or her health. Following up with health care providers. The patient needs to regularly see the physician to monitor his or her recovery and control risk factors. Routine stress testing is a part of the follow-up treatment to detect restenosis that may occur without symptoms. Although coronary stents greatly reduce the risk of restenosis following balloon angioplasty, there is still some risk that the stented artery may close. Serious complications are uncommon, but may include infection, damage to the heart or blood vessels, and blood clots. Anticlotting medication is given after stent placement to prevent the risk of blood clots. Less serious complications include bleeding, swelling, or bruising where the catheter was placed. The patient usually goes home the day or evening of the procedure, but sometimes an overnight stay in the hospital is necessary so monitoring can be continued. Patients should have someone to take them home after the procedure; driving is not recommended for at least 24 hours after the procedure. Fatigue and weakness are common after the procedure. The patient should limit activities for the first two days after the procedure and can gradually resume normal activities by the end of the week. For the first week after the procedure, pushing and pulling heavy objects (as in mowing the lawn) should be avoided, and lifting objects more than 20 lbs (9 kg) is not permitted. Stair climbing is permitted unless other instructions have been given. Balloon angioplasty and the placement of a stent do not prevent coronary artery disease from recurring; therefore, lifestyle changes are strongly recommended and medications are prescribed to further reduce this risk. Death is very rare (1%) as a result of the stent placement procedure. Sometimes a blockage returns to the treated coronary artery (restenosis). If restenosis occurs, it usually happens within the first six months after the procedure. If the patient has previously experienced restenosis, there is an increased risk that it will recur. Repeat blockages can be treated with other interventional procedures; coronary artery bypass graft surgery may be needed. All patients with coronary artery disease can help improve their condition by making lifestyle changes such as quitting smoking, losing weight if they are overweight, eating healthy foods, reducing blood cholesterol, exercising regularly, and controlling diabetes and high blood pressure. All patients with coronary artery disease should be prescribed medications to treat their condition. Antiplatelet medications such as aspirin or clopidogrel (Plavix) are usually recommended. Medications may also be prescribed to lower lipoprotein levels, since elevated lipoprotein levels have been associated with an increased risk of cardiovascular problems. Treatment with vitamin E is not recommended because it does not lower the rate of cardiovascular events in people with coronary artery disease. Although antioxidants such as vitamin C, beta-carotene, and probucol show promising results, they are not recommended for routine use. Treatment with folic acid and vitamins B 6 and B 12 lowers homocysteine levels (reducing the risk for cardiovascular problems), but more studies are needed to determine if lowered homocysteine levels correlate with a reduced rate of cardiovascular problems in treated patients. Other interventional procedures used to open a blocked artery include rotoblation, brachytherapy, and atherectomy. Coronary artery bypass graft surgery is a treatment option that is considered when medications and interventional therapies do not adequately treat coronary artery disease. 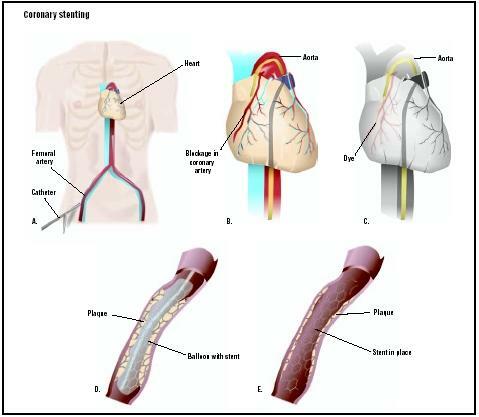 During coronary artery bypass graft surgery, a blood vessel graft to restore normal blood flow to the heart is used to bypass one or more blocked coronary arteries. These grafts usually come from the patient's own arteries and veins located in the leg, arm, or chest. Enhanced external counterpulsation (EECP) may be a treatment option for patients who are not candidates for interventional procedures or coronary artery bypass graft surgery. During EECP, a set of cuffs is wrapped around the patient's calves, thighs, and buttocks. These cuffs gently but firmly compress the blood vessels in the lower limbs to increase blood flow to the heart. The inflation and deflation of the cuffs are electronically synchronized with the heartbeat and blood pressure using electrocardiography and blood pressure monitors. EECP may encourage blood vessels to open small channels to eventually bypass blocked vessels and improve blood flow to the heart. Not all patients are candidates for this procedure, and treatments, lasting one to two hours, must be repeated about five times a week for up to seven weeks. American Heart Association. "Considering Surgery or Other Interventions." In Guide to Heart Attack Treatment, Recovery, Prevention. New York: Time Books, 1996. Barry, Frank. The Healthy Heart Formula: The Powerful, New, Commonsense Approach to Preventing and Reversing Heart Disease. New York: John Wiley & Sons, 1998. Garratt, Kirk N., Guy S. Reeder, and David R. Holmes Jr. "Cardiac Catheterization and Angiography." In Mayo Clinic Practice of Cardiology, edited by Emilio R. Giuliani, et al. St. Louis: Mosby Publishing, 1996. McGoon, Michael D., and Bernard J. Gersh. Mayo Clinic Heart Book: The Ultimate Guide to Heart Health, Second Edition. New York: William Morrow and Co., Inc., 2000. Texas Heart Institute. Texas Heart Institute Heart Owner's Handbook. New York: John Wiley & Sons, 1995. Trout, Darrell, and Ellen Welch. Surviving with Heart: Charge of Your Heart Care. Golden, CO: Fulcrum Publishing, 2002. Dangas, George, and Frank Keupper. "Restenosis: Repeat Narrowing of a Coronary Artery." Circulation 105 (2002): 2586–2587. Michaels, Andrew D., and Kanu Chatterjee. "Angioplasty versus Bypass Surgery for Coronary Artery Disease." Circulation 106 (2002): e187–e190. American College of Cardiology. Heart House. 9111 Old Georgetown Rd., Bethesda, MD 20814-1699. (800) 253-4636, ext. 694, or (301) 897-5400. http://www.acc.org . American Heart Association. 7272 Greenville Ave. Dallas, TX 75231. (800) 242-8721 or (214) 373-6300. http://www.americanheart.org . The Cleveland Clinic Heart Center, The Cleveland Clinic Foundation. 9500 Euclid Avenue, F25, Cleveland, Ohio, 44195. (800) 223-2273, ext. 46697, or (216) 444-6697. http://www.clevelandclinic.org/heartcenter . National Heart, Lung and Blood Institute. National Institutes of Health. Building 1. 1 Center Dr., Bethesda, MD 20892. E-mail: NHLBIinfo@rover.nhlbi. http://www.nhlbi.nih.gov . The Heart: An Online Exploration. The Franklin Institute Science Museum. 222 North 20th Street, Philadelphia, PA, 19103. (215) 448-1200. http://sln2.fi.edu/biosci/heart.html . Heart Information Network. http://www.heartinfo.org . A team of specialized heart doctors (cardiologists), nurses, and technicians trained in stent placement should perform this procedure. Stent placement usually takes place in the hospital setting in a special lab called the catheterization laboratory. It may also be performed in an intensive care unit , emergency room (such as for treatment of a heart attack), or other special procedure room. Can I eat or drink the day of the procedure? If not, how long before the procedure should I stop eating or drinking? What should I wear the day of the procedure? Will I have to stay in the hospital after the procedure? What if the procedure was not successful? If I have had the procedure once, can I have it again to treat coronary artery disease? Will I have any pain or discomfort after the procedure? If so, how can I relieve this pain or discomfort? Are there any medications, foods, or activities I should avoid to prevent my symptoms from recurring? I like what I read just would like a little more information procedures. I had a question. At what age do most people start having stents put in? I know someone in their 30's that just went through this procedure. Is this common for someone the young to have a stent? The information that I read above concerning stents was very informative. very useful information, thank you. But, what kind of excercises can one practice after such operation? Information above was informative. However, I have a question. My husband had a stint placed in his heart about 2 weeks ago. He did not quit smoking and since has complained of pulling feeling in his chest, feeling weak and fatigued, and dizzy at times. I have encouraged him to quit smoking and to call his doctor. He says he has a doctors appointment and will talk to him then. What can I do to help him. My husband had a stint put in through his arm about two weeks ago. Bruising goes all the way up arm and is swollen. My husband complains it hurts in the evening is this normal? I read this article and I must say it is well written. Why wouuldnt a surgeon do all stents at 1 time? instead of saving on for outpatient? My mother had a stent put in through an artery from the upper leg. Unfortunately things did not go well for her. Apparently the stent "blew" the artery out and she bleed out 8-9 units of blood. This caused her to have a "stroke" then a "heart attack".Luckily the nurse discovered it when she did or my mother would not be here today. Could this have been avoided ? I really think the doctor made a mistake by outting the wrong size of "stent" in her. She weighs about 90 lbs and from what have read the only insidents similar to my mothers happened to very small wemon. I just feel that this should not have happened...please comment.R.S. What is the life of a stent with medicine coated after it is inserted in the artery? Please comment. I just have had stents 4 total Lad and Mid Lad and some damage on the back side of my heart due to a mild attack. I have already stopped smoking and continue to improve my diet. Im taking plavax atenalol asprin verapamil and simvastatin. I am hopeful to make a full recovery. Can you offer any encouragement other than what i have read? I was diagnose with unstable angina recently. I have no medical insurance of any kind. What can I do to get help with after surgery medication. I have applied for state help. Denied. I have applied for help through hospital and clinics. Again denied. Was told told at this point its 50/50. I have applied for ssi and was denied so I am fighting it now. So any help would be greatly appreciated. I'm having a heart catheterization done next week and a stent put in if needed. I plan to ski out west ASAP after the procedure. If all goes well, what is the average recovery period? I'm 65, and in good shape. I had a stent 6months ago, and now I feel my heart beat is too high to a point where I feel it, should I be worried? My 60 year old mom had a stent put in her heart thought her wrist 5 days ago. Three days after the procedure she had a 102 fever. I took her to the hospital and results came back OK. They took out more blood to check for a blood infection. We have to wait 48 hours. She was sent home. She continues to have a fever more in the evening. She doesn't feel like eating and is nauseated. She is very tired. How can I help her? Seems that outpatient angioplasty is a very common procedure. What puzzles me is 90 percent result in stent placement. Remember when you bought a new car in 70's you had to get undercoating. I am experiencing blood in my urine and passing blood clots. this happened with the first heart cath and stent placement in August, and is happening again after my heart cath and stent placement Thursday 10/22/2015. Is this normal? My husband had a second stent put in through his leg about 6 months ago when surgery was done the nurse applied alot of pressure on his leg he said it hurt she said she had to do it to stop the bleeding. He.has tenderness on his left side of his stomach and from time to time he gets a bruise. He has no energy. What could be causing this. We are suppose to see the doctor on the 14 th of this month but should we go.over to emergency room before that. I underwent what my cardiologist called a routine stent procedure. I was hospitalized overnight and sent home. Seven days later I had a heart attack due to my stents occluding. My wife and I were informed that I had died on the table during the operation to correct the occluded stents. My cardiologist further stated that he had no idea how much damage was done to the back of my heart.I found out later that my subsequent heart attack and flat line experience were due to the fact that neither the hospital, PA or Doctor informed me to take Plavix after releasing me from the first procedure. I am now trying to cope with the after effects of my heart stopping. My current Doctor's tell me that I must get used to living a " new norm life". I am looking for someone to explain what I can expect since my heart stopped. All I know is that since this happened I am experiencing very negative effects both physically and mentally. If there is someone who has dealt with this or information such as articles dealing with this subject I would like to read them. My dad had a stent procedure on Thursday. The stent was placed and when they were removing the coronary catheter they ruptured his artery. They had to drill a hole in his chest and place a tube to drain the blood. Then they had to close the ruptured artery. During this he experienced another heart attack. He survived amazingly. Two days later he died. The closed artery ruptured and caused another heart attack. He was still in hospital. Why didn't they monitor this ruptured artery and check for any leaking blood? Surely this would have been an important step to making sure he was recovering properly. I had 2 stents put in 35 days ago and have been short of breath ever since ( real bad) It started as soon as I started taking my medicine. ( I am a previous smoker) the meds that I take are Carvedilol, Atorvastatin, and Clopidogrel. Why should patient suffer dizziness a fortnight after a stent was fitted? My brother died last year n he had a stent put him but on his death certificate it was possibility a heart attack? I believe my brother was murder and he had two people look at him? He just had a check up n he pass every test, he wasnt over weight he age healthy n he also worked out! I read 1percent of people died, I read that a person was on a table n had a heart attack but survived? If my brother was at home n his crzy other didnt do anything to help him, n she killed before when she was younger n got away with it? Is there something we can do? I had a stent put in 2 weeks ago and i have 0 energy i sleep 24/7 have to force myself to get up this is not like me i am 45 in good shape very active ive quit smoking since the day of the stent placement wheres all my energy? Is there something wrong with me sleep sleep sleep is all my body does i dont want to sleep knowmore help has anyone else experienced this much sleep? I had 2 stents through my wrist in October, with no problem. My question is about 2 weeks ago my wrist starting hurting no swelling no redness just hurt ? My dad's energy has declined since he had his stent put in two months ago. Also now his feet are swollen. He now sleeps alot. To me this can't be normal. What could be causing this? My dad put a stent and after 5 days he had head bleeding he stayed in the ICU for 3 weeks and later he started to get better but from that date til l today he stoped taking Brillanta and asprin.he have a Brain CT scan and the results where good so we are afraid to give him again the Brillinta and asprin and as i know its not good to stop giving the patient this medicine because the stent will be blocked so ,could any one advice me what to do? Why arent these problems being addressed by the hospital and your doctors immediately.i dont understsnd all these problems people should be under care at all times while trying to recover also be educated at the same time this is nothing to mess with its your life on the line kets not be casual about this its scarey.